I recently read Chasing Francis: A Pilgrim's Tale by Ian Morgan Cron, which was provided to me by BookSneeze for the purposes of this review. After losing faith and experiencing a spiritual breakdown right in the middle of preaching at the mega-church he founded, Pastor Chase Falson sets off on a pilgrimage of sorts. His uncle, a Franciscan priest, leads him across Italy, where he encounters the teachings of Francis of Assisi. With Chase's future in the ministry and even his Christian faith in doubt, he discovers anew what it means to be a follower of Christ. This book is of the genre of wisdom literature, which means it uses a fictional story to teach the reader about a topic. This, my friends, is how I like my non-fiction: disguised in a story. I've shared before how difficult it is for me to read non-fiction, and believe me, I would not have sat down to read a biography of Francis of Assisi or a book about his teachings. But after reading this book, I would love to learn more about Francis--his life and teachings are fascinating. There is a law in physics that applies to the soul. No two objects can occupy the same space at the same time; one thing must displace another. If your heart's crammed tight with material things and a thirst for wealth, there's no space left for God. Francis wanted a void in his life that could only be filled with Jesus. Poverty wasn't a burden for him--it was a pathway to spiritual freedom. The wording is a little stilted at times, the author trying to pack as much information as possible into this short novel. In fact, in the included study guide, he mentions that he had to leave out much of the information he wanted to include. But all in all, I found the book to be interesting and informative. I recommend this book to anyone looking to learn more about the teachings of Francis of Assisi, and those seeking to fall in love again with a Christ-centered life. Alright, so maybe you're not really in the mood to think about snow right now, but I can't help it--that's what this stuff is called. You don't need snow on the ground to appreciate it, though. I made up a big batch of this stuff to take with me on a weekend jaunt, and immediately, the kiddos insisted I make a second batch to leave with them. This trail mix has got it all: sweet and salty, crunchy and chewy, all smothered in yummy melted white chocolate. I first came across this recipe years ago in Family Fun magazine. Now you can find it here. In a large bowl, mix together the pretzel sticks, cereal, pecans, cashews, and dried cranberries. Melt the white chocolate according to the package directions and slowly pour it over the mix, stirring gently. Scoop the mix onto waxed paper to cool, about 20 minutes, then break it into bite-size clumps. Makes about 10 cups. I used vanilla chex (it's new, and yum--check out the coupons tab above for a free printable coupon) for the cereal, but this would be yummy with just about any non-flake, non-overly-sweetened cereal (other chex varieties, crispix, cheerios). I ended up adding about 3 cups of cereal instead of the 1.5 cups suggested in the recipe. I tend to do that with all recipes that call for cereal, like rice krispie treats, muddy buddies, and marshmallow star cookies. One and a half cups just didn't look like enough. I used a 12 oz bag of vanilla flavored white candy melts for the white chocolate. You could make this mix using different colors of candy melts for different holidays, like orange and black for Halloween, green for St. Patrick's Day, or use your graduate's high school colors for a graduation open house. This recipe is delicious as written, but as with just about all trail mix recipes, it's totally customizable to your taste. Just make sure the keep the ratio of dry to wet ingredients about the same. Don't like nuts? Leave 'em out. Want more fruit? That sounds good to me. Want to just coat stick pretzels in white chocolate and call it trail mix? Go for it. Several months ago, our pastor mentioned a woman he knew who was hyper aware of God's presence in her life. For example, he said, when this woman went to the store and found a parking spot right by the door, she would say, "thank you Jesus, for this parking spot!" The congregation laughed deprecatingly, perhaps thinking that was a little frivolous, or even ridiculous, to think that God would care about parking. Obviously, those folks don't have parking anxiety. I, on the other hand, was nodding my head, thinking, "I do that, too." Maybe not out loud, but I am seriously thanking God for providing a parking space for me. As I have shared in the past, my parking anxiety has definitely affected my life. I simply don't go places if I don't know what the parking situation will be. It's not so much parking that is the problem--it's the worry that I won't be able to leave my parking place when the time comes. 'Cause as I've also shared, I'm not the best backer-upper. But do you know what? God doesn't want us to live in fear, and that's what anxiety is, plain and simple. God doesn't want us to limit ourselves based on fear or anxiety or anything other than God's love. My friends, I was a slave to parking anxiety, letting it tell me what to do, and what not to do. And that's when I realized that God does care about parking. Because God doesn't want me to be anxious about an . y . thing. Nothing. Not what I will eat, not what I will wear, not what tomorrow will bring, and certainly not where I will park. Is not life more than food, and the body more than clothing?" So I decided to claim God's promise--to live it out every day as it relates to my parking anxiety. My friends, I stared to pray. Each day, when I set out for a destination with an iffy parking situation, like say, my kids' school on the last day, or Dairy Queen right after lunch on a sunny 80 degree day, I ask God to prepare a parking space for me. And God has provided. Every. Single. Time. Now, sometimes, I will look at the spot, the spot that God has prepared for me, and think that God's got to be kidding. Sure, I can get into it, but no way I'm getting back out. But I stretch and I trust, and I do. Frivolous? Ridiculous? I don't think so. Because I've learned to trust God for that parking spot. And if I can trust God to provide something as unimportant (in the grand scheme of things) as a parking spot, I know, beyond the shadow of a doubt, that God's going to take care of me on the big stuff. My friends, what are you anxious about? What area in your life, big or small, do you need to trust to the Provider? I challenge you to give it up to God today. Right now, and as often as you need to. The tooth fairy visited our house last night (about time--MC's been waiting for weeks...major tooth fairy fail for the 10 year old. My fabulous friend J thinks the tooth fairy has a drinking problem, 'cause that happens at her house, too) and look what he left for a certain little boy who just lost (and I mean really lost) his first tooth! It's a tooth monster! It didn't come with instructions, but I'm pretty sure Bubby's supposed to put his lost tooth in there, and the tooth fairy will leave a surprise. My baby lost his first tooth! And by "lost it," I mean, he really lost it. In his sleep, and nowhere to be found. Probably snaking its way through an intestine right about now. This is probably a good thing, I mean that he really lost it, because I thought I had another week or so to make the surprise, but since we don't have an actual tooth, the surprise is not quite as critical (shew! Disaster averted). Even so, you can bet I'll be working on it today (pictures tomorrow, hopefully). Well, it's my birthday today. Yay me. Here's my other birthday treat. You know, the one I didn't have to make myself, because my fabulous friend J took pity on me. And good thing, too. That chocolate layer took so long to whip, we won't be able to eat the S'mores cake today because it won't have been in the freezer long enough. And yes, it tastes as good as it sounds, which is to say, heavenly. Thank you, J! Because there are things that our children will need to know how to do as adults, and we've discovered that their education seems to be lacking in some of these key areas. The importance of staying warm: No, it won't kill you to wear a coat...but it might kill you not to. And there you have it. The Course for Life. Each hour-long session will consist of a pre-test, lecture, and hands-on practice in our fully equipped lab environment, ending with a proficiency exam--children will not progress until they have mastered the topic of each class session. By the end of the 16 week course, your children will be proficient in all of these tasks. The final exam, which will consist of a real home environment in disarray, presenting random challenges from among the topics taught, will be given, by appointment, in December. I will be working on lesson plans over the summer and hope to offer the first session beginning in September. Oh my goodness, I'm having a hard time writing this post! Much harder than it should be. I don't know how many times I've sat down to work on it, and multiply that number by about 237 to find the number of times I've thought about it in the past month and a half. Sheesh. With the appearance of buds on our boxelder trees at the end of April, the syruping season has finally come to an end. In total, we collected more than 70 gallons of sap, which we reduced to about 1.5 gallons of syrup. It was fun. It was educational. It was yummy. To read all of the sappy posts in this series, click here. Morning, y'all. I came across this recipe and thought I should share it with you (yes you, Chip). 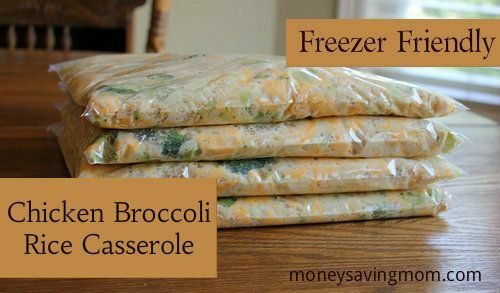 So easy to put together, and makes enough for 4 meals--perfect to throw in the freezer for those busy days when you're not sure how you're going to get supper on the table. * If you don't like using goopy cans of cream of whatever, check out this recipe for cream of anything soup. You can make large batches and freeze in can-sized quantities to get the convenience of a can without any questionable ingredients. I love recipes that are so easy to put together and make my life easier down the road as well. This large batch took no more time (and produced no more dirty dishes) than it would have to make a single batch, and now I have supper for us and some friends for tonight, plus two more meals in the freezer. Did you know my birthday's coming up? Yup. And as I've said before, the advantage of making your own birthday cake treat is that you end up with exactly what you want. I don't like cake, but since cake is practically synonymous with birthdays, that's what I'd probably end up with if someone else was in charge. Anyway...this is what I'm making. Here's the recipe, just in case you want to make one in my honor. I recently read Wishing on Willows by Katie Ganshert, sent to me by WaterBrook/Multnomah for review. Wishing on Willows is the story of Robin Price, a young widow with a 3 year old son. Before her husband died, they shared a dream to open a cafe in small town Peaks, Iowa, and after his death, she has achieved that dream. Robin loves that cafe, and all it represents--the lasting legacy of the love of her life, but it's struggling. Robin runs the cafe more like a ministry than a business and rarely turns a profit. Developer Ian McKay shows up in town one day with a plan to tear down her beloved cafe and an important town ministry to build condos. Ian has strong reasons for wanting the deal to go through, while Robin has equally strong reasons for not wanting to let the cafe go. While Robin has obvious hurt and complications in her life, Ian is harboring hurt in his past as well, and is on a mission to push this project through. He is a man with something to prove. This book is excellent. It's so artfully written and real, compelling, and almost impossible to put down. Katie Ganshert's characters are so real, I felt like I knew them, like I could just pop in to the Willow Tree Cafe for a cup of chocolate, and I found myself grieving with Robin and wondering how she could stand in the face of all that had happened. Katie Ganshert manages to portray beautifully the pain we bring on ourselves when we try to struggle on when our Heavenly Father wants to take the load from our shoulders. She shows how our lives can turn out to be immeasurably more than we imagine, if we just allow God to direct them instead of trying to do things our own way. I knew fairly early on how this book would end, but I couldn't picture how it would come to pass, so I had to keep reading to find out--there was just the right amount of literary suspense. Just like in our own lives as Christ followers, we know how it all ends, but we still need to show up and live our lives to find out how we get there, and all the wonderful twists and turns in between. Disclosure of Material Connection: I received this book free from the publisher through the WaterBrook/Multnomah Blogging for Books program. I was not required to write a positive review. The opinions I have expressed are my own. Did you like this review? Please take a moment to rank it below. As a thank you, you will be entered into a drawing to win a copy of this book. I recently read Prayer Warrior Mom: Covering your kids with God's blessings and protection by Marla Alupoaicei, which BookSneeze provided to me free of charge. The book contains 15 chapters, each highlighting a different way moms can pray for their children. Each chapter includes a several page explanation of a prayer type, a prayer that can be personalized when prayed by inserting kiddos' names, or specific worries or issues, plus several Bible verses pertaining to the topic of the chapter, meant to be memorized and prayed for our children, and a few small group discussion questions. In Prayer Warrior Mom, author Marla Alupoaicei invites you to walk with her through fifteen life-transforming principles that will empower you to effectively intercede for your children. You will learn to pray Scripture, be persistent, pray with power and authority, be your children's #1 advocate, hear God's voice above the noise of daily life, and much more! I liked this book. I do pray for my children daily, but I found it helpful to pray for them intentionally, and in new and specific ways each week as I read through the chapters. Although written specifically for moms, anyone who love a child and wants to pray for them will find this useful. I think this will be one I will return to again and again. We all have them. And they seem to multiply while we're not looking. I had amassed quite the collection, because, you know, they give those things away for free. And it's really difficult for me to pass up free stuff. Especially useful free stuff. So they were kind of out of hand. OK, seriously out of hand, taking up way too much space in Bubby's closet because there wasn't enough space for them in the mud room, and I didn't know what else to do with them. Do you have this problem, too? Well, you're in luck, my friend, 'cause I'm gonna tell you what you can do about it. First thing you have to do is get rid of some of your bags. I know, I know! They were free! And they're useful! But believe me, my friend, unless you are buying $1000s of dollars of groceries at one time, you do not need 37 reusable shopping bags. I went through my stash and took out the ones with torn seams or handles, and one or two that I just plain didn't like, which brought me down to a manageable 7 or so. Fold the bag into thirds, with the handles at the top. Or bottom. They just need to be sticking out somewhere. Start rolling the bag from the side opposite the handles. When it's all rolled up, it'll look something like this. Take one handle and wrap it around the rolled-up bag one way, and wrap the other handle around the other way. Then, tie the handles together. That's it! So easy. And so much more manageable! Store your rolled-up reusable shopping bags in a small tote bag or box near the door or in your car, and you're all set. When you need a bag or two, just grab 'em from your stash. Remember when I told you about this mission? Well, the nice folks over at Smiley360 drafted me for another mission--this time to try Emergen-C. Keep reading to learn how to get your own free samples of Emergen-C.
Just what is Emergen-C, you ask? It's a powdered drink mix that provides immune support. Each packet contains key nutrients, including 1000 mg of vitamin C, 7 B vitamins for energy, electrolytes, and more. With over 20 varieties, you're sure to find one that fits your needs. Oh, and the best part? It fizzes. Yes it does. Smiley360 sent us 5 flavors to try: Blueberry-Acai, Cranberry-Pomegranate, Super Orange, Pink Lemonade, and Raspberry. I didn't like any of them. They were all too sour for my taste, and some of the flavors left a slight bitter aftertaste. The kids, however, L O V E D it. AKD's favorite was Pink Lemonade, MC's was Blueberry-Acai, and Bubby liked the Super Orange. The loved the fizz, they loved the taste, they loved that mom was giving them flavored drinks in the middle of the day for no apparent reason...and you know, I try to feed my kids a balanced diet, but I know that their diet is far from perfect. I love anything that helps get more nutrition into them, like Emergen-C. If you'd like to try it yourself, click here for a free sample or to learn more about Emergen-C.
Is school out for you yet? Seems like most of the world is ending school in the next couple of days. We still have a week and a half left, but I've been planning for weeks. You see, I've discovered that, although it is exhausting, the busier we are, the less I yell. And the less I yell, the happier we all are. So I like to plan for all of that busy-ness. One issue I had with summer planning in the past is I didn't have a way to look at the whole summer at a glance. It is such a pain to have to keep flipping those calendar pages over to see what we have going on and it's impossible to get good feel for the entire summer that way. To deal with that problem, I found this customizable printable calendar online--it says it's a 12 week calendar, but you can totally tell it to print fewer or more weeks. I input our school end date, told it I wanted 13 weeks so the calendar would include our school start date, printed it out, and started filling in swim lessons, camping trips, vacations, appointments, and day camps.